: His instinct to herd and guard the flock is strongly developed, but he can also be well used as a guard dog. : The Croatian Shepherd Dog is at the lower limit of the medium sized dogs. The basic colour is black. The short hair on the head and the legs is the characteristic sign of the breed. : The length of the body exceeds that of the height at withers by about 10 % making the body outline rather rectangular. : Lively, attentive, modest and easy to train. : Relatively light, wedge-shaped. The length of the muzzle compared with that of the skull is of 9 to 11. The total length of the head is about 20 cm. : While narrowing, continues into the muzzle; the superciliary arches are not developed, the cheeks are rounded, but the head on the whole is lean. The frontal furrow is not marked, the skull seen from above is oval. The occipital protuberance can be marked. : Always black and not prominent. : Lean, the profile of the nasal bridge is straight, and this in conical shape is an extension of the upper part of the skull. The lower jaw is in good proportion with the foreface so that the muzzle is neither too pointed nor too blunt. : Thin, tight fitting and elastic, with firm labial corners. The visible mucous membrane of the lips is black. : Well developed and in scissor bite. The pincer bite is permitted but undesirable. Complete dentition. : Brown to black, medium size, almond shape, with lively expression. The eyes are not set oblique. The well fitting eyelids are dark in pigmentation. : Triangular, pricked or semi-pricked, of medium length and set slightly to the side. The pricked ears are desirable. Cropping is not permitted. : The neck is oblique in comparison with the topline; in profile upper and lower lines are straight; moderately long, deep, muscular, well rounded but not too strong. The skin is without folds, covered with thick hair. : Not prominent. The transition from the neck region to the back is gradual and hardly visible. : Short and well muscled. : Of medium length, slightly oblique, well muscled and visibly broad. : Of medium length, rather broad and deep, well sprung ribs. Forechest not pronounced, in profile its line is merging with the lower line of the neck. : Slightly tucked up. The flanks full and firm. : Set moderately high, the hair dense and bushy. 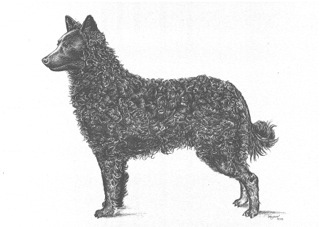 At rest, carried low or level with the back; when the dog is alert, it is carried above the back line. The puppies may be born without tails or they are docked so that they are not longer than 4 cm on the adult dog. : The forelegs are straight and parallel seen from the front. The angulations are fairly open making the forequarters rather upright. The legs are of medium length. The shoulders slightly oblique, medium length, well muscled. The upper arm is relatively short, forearm long and muscled. Light bone structure. The pastern joint is lean and not distinguishable from the rest of the forearm, the pastern not completely vertical; the foot small, of elongated shape. The toes are tight, the nails black or grey, the pads firm. : The hindquarters have moderately open angulations. Seen from behind, the limbs are parallel; the thigh is rather long and the hock close to the ground. The thigh moderately broad, muscled. The hock is lean, well developed with a moderately open angle. The feet are similar to the front feet, although more elongated. Dewclaws should be removed. : Preferred gait is the trot and the length of the stride is moderate. : The hair on the back is of 7 to 14 cm long. The facial part of the head is invariably covered with short hair. The outer side of the ears is covered with short hair and with longer hair on the inner side. The backside of the forelegs is fringed with long hair down to the pastern. The hind legs have culottes (fringes) which go down to the hock. The hair is relatively soft, wavy or even curly. Must never be wooly. The undercoat must be dense. : The basic colour of the hair is black. A few white markings are allowed. White markings on the head, the body and the tail are not permitted, whereas below the throat, the chest and under the chest, they are permitted but undesirable. Stockings or socks lessen the qualification. : The size at the withers for males and females varies from 40 to 50 cm. Any other than black pigmentation of the nose. Loss of more than 2 first premolars (PM1). Coat entirely woolly or too long. Long hair on the face. White markings on the head, the body and the tail. Height at withers more than 50 cm and below 40 cm.